The MaxOak 185Wh/50000mAh Battery Pack offers plenty of power inside, but weighs as much as most laptops and doesn’t offer a quick and convenient way to charge your devices due to its slow outputs. It’s difficult to go more than a few feet nowadays without coming across a power outlet (or at least a USB port), but on those rare occasions you’re away from any source of power, it's nice to have a backup battery on hand for when your laptop or smartphone dies. While there's no shortage of options on the market, there aren’t many that can keep you going for days. That’s not the case with the MaxOak 50000mAh, an absolutely massive and robust charger that attempts to be the jack of all when it comes to charging gadgets on the go. It’s power comes at the cost of massive size and the charging ports aren’t too fast, but if you need tons of power, this is the battery pack to get. First and foremost, this thing is a tank. At 2.77 pounds, it weighs many times more than most smartphones and nearly as much as most compact laptops. It also measures in at 8.1 x 5.3 x 1.3 inches (HWD), making it quite the behemoth to lug around. A small detail regarding the weight of the MaxOak is that it isn't balanced. The side without the ports holds a fair bit more weight than the side with the various ports. It's not a significant detail, but one you might notice with time. As for the materials, the metal enclosure and place ends give it a fairly solid feel, but the metal doesn't sit perfectly flush with the plastic ends, at least not in our model. It could be a one-off quality control issue or it might simply be the way in which the charger is constructed, but it's definitely noticeable. The number of ports integrated into the charger is impressive. It includes four USB Type-A ports—two 2.1A and two 1.0A—as well as two AC plug-in style connections—a 12-volt 2.5A plugin and a 20-volt 5.0A plugin. This offers a solid range of options for charging alongside the slew of connection adapters MaxOak includes with the charger. That said, it would've been nice to see a USB Type-C port (or two) considering how ubiquitous they're becoming. At 2.77 pounds, it weighs many times more than most smartphones and nearly as much as most compact laptops. Charging the device is done via a small 16.8-volt 2.5A plug-in style port on the opposite side of the power button. Overall, the design is roughly what you'd expect from a 50000mAh laptop battery charger. Yes, it's heavy, yes it's quite beefy in size, but it comes with the territory. Setting up the MaxOak laptop battery charger is as simple as it gets. After removing it from its unbranded cardboard box, it's simply a matter of plugging it in and getting it charged up completely. Our device came charged at roughly 50% based on the onboard LED battery indicator, but to complete our tests we wanted it charged entirely, which leads us to our biggest complaint about this charger. The point of a charger is to have extra battery power on hand when needed so you don't have to carry around unnecessary cables when traveling. Unfortunately, the MaxOak battery pack doesn't use any kind of USB or standardized port. Rather than charging it with a USB Type-C or even a micro-USB port, the MaxOak battery pack relies on its own proprietary power supply that's nearly as large as most laptop chargers. Sure, the 50000mAh onboard is likely enough that you could leave both the battery pack charger and your laptop charger behind for most events, but eventually you'll run out of juice and rather than reaching for a cable you would probably already have in your bag, you're stuck bringing along a proprietary charger. The MaxOak 50000mAh manages to charge at a decent rate considering its capacity, but we would’ve liked to see more high-powered ports for speedier charging. We charged and fully drained the MaxOak power bank five times and charging took roughly six to eight hours per recharge with an average of seven hours and fifteen minutes. One nice bonus is the power bank can be charged while also giving a charge to a laptop or mobile device, adding an extra element of convenience. Charging the power bank itself is only one half of the equation though—and arguably the less important half. More importantly, is how well it can charge other devices. At 50000mAh/185Wh, the MaxOak power bank offers one of the highest capacities out there for a device of its size. For mobile devices, we tested it on both a Samsung Galaxy S8 Active as well as an iPhone XS. For laptops, we tested it with an ASUS X555LA notebook. The MaxOak power bank charged the Samsung Galaxy S8 Active just shy of twelve times from 0% to 100%. This aligns almost exactly with the 50000mAh capacity of the MaxOak power divided by the 4,000mAh capacity of the Samsung Galaxy S8 Active. We experienced similar results with the iPhone XS. While Apple doesn't specifically mention the battery capacity of the iPhone XS, third parties have reported it to be approximately 2,700mAh, which would equate to roughly 18.5 full charges. In our tests, we were able to get 17.5 charges from the MaxOak power bank. Moving onto laptops, our ASUS X555LA was able to be charged four and a half times from 0% with the MaxOak power bank, with an average charge time of three hours or so. The ASUS X555LA has a relatively small battery compared to most laptops, which means it falls in line with MaxOak’s claims that its power bank can charge a laptop two times over give or take a little. The MaxOak 50000mAh power bank comes in at $135.99 at the time of this review. This is a reasonable price when taking into consideration how much battery capacity you're getting with it. In terms of pure capacity, the MaxOak doesn't have much competition. There are only two other 50000mAh power banks on Amazon: the Crave PowerPack and the Renogy power bank and all of them use the exact same design, just with different branding. In terms of pure capacity, the MaxOak doesn't have much competition. The Crave PowerPack retails for $139.99, exactly $4 more than the MaxOak power bank, while the Renogy power bank retails for just $109.99, a full $25 less than the MaxOak power bank. 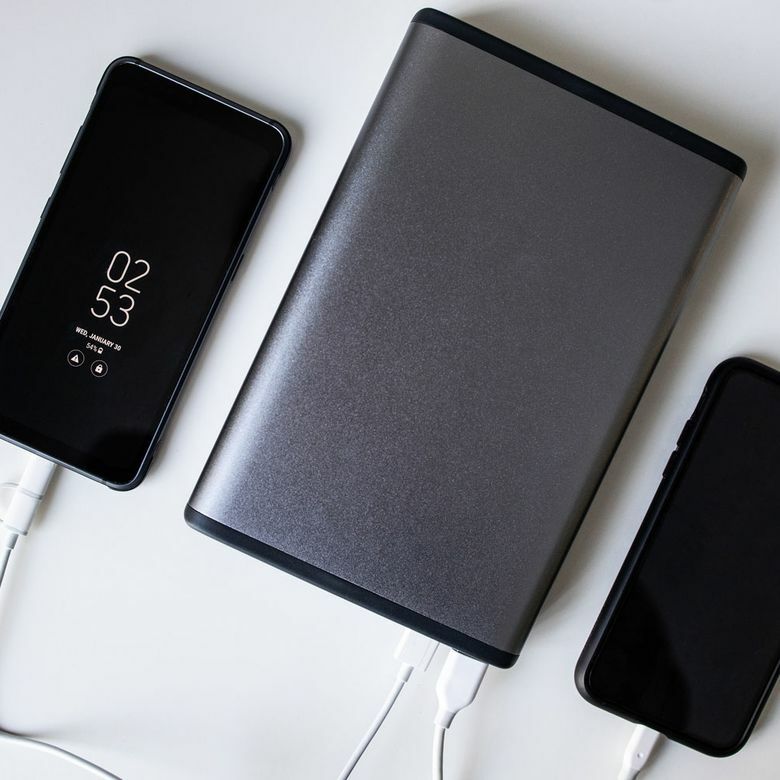 Considering all three power banks appear to be identical to each other in capacity and accessories, the Renogy looks to be the best value. Want to see how other brands compare? Check out our other reviews of the best portable laptop battery chargers available on the market today. Plenty of power, but output is lacking. Overall, the MaxOak 50000mAh is a decent power bank with massive capacity. However, it isn't designed with newer computers and devices in mind. If you have an older laptop on hand that isn't a MacBook (the MaxOak doesn't support any MagSafe connectors) or doesn't use USB Type-C for charging, it'll get the job done. But if your smartphone or laptop is newer and relies on more recent and powerful connections, you're going to want to look elsewhere. Product Dimensions 8.1 x 5.3 x 1.3 in.